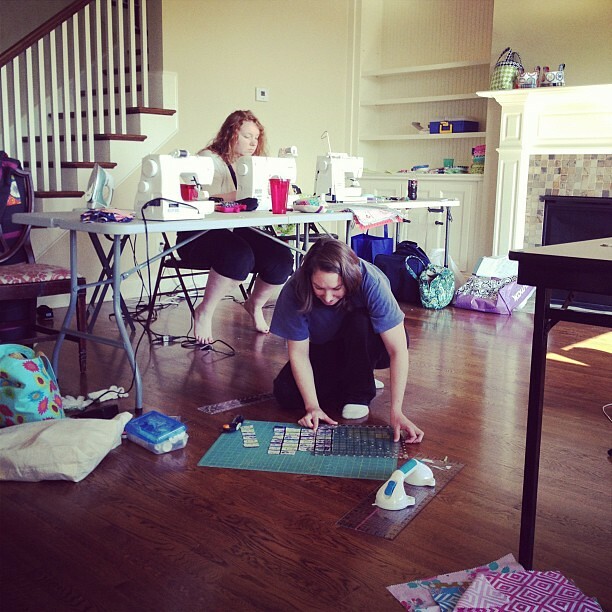 I got together with a few of my quilting friends last weekend and had a blast! We decided to camp out in my empty house since we aren't moving until May. 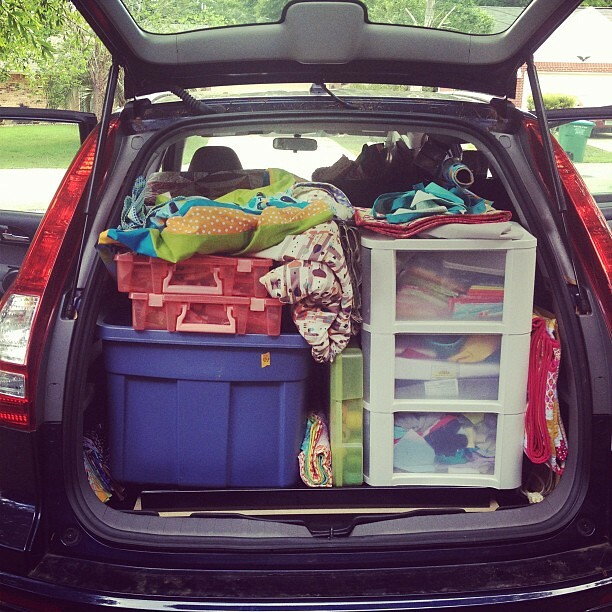 I started with a car full of stuff! 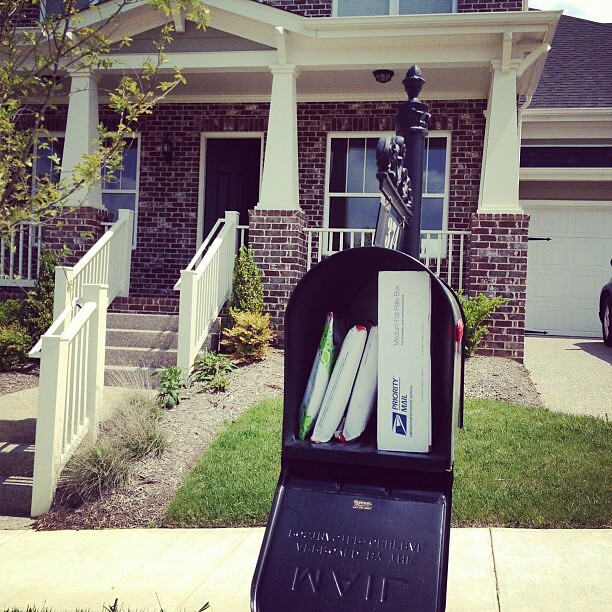 When I got to the house I already had fabric mail in my King Kong sized mail box! 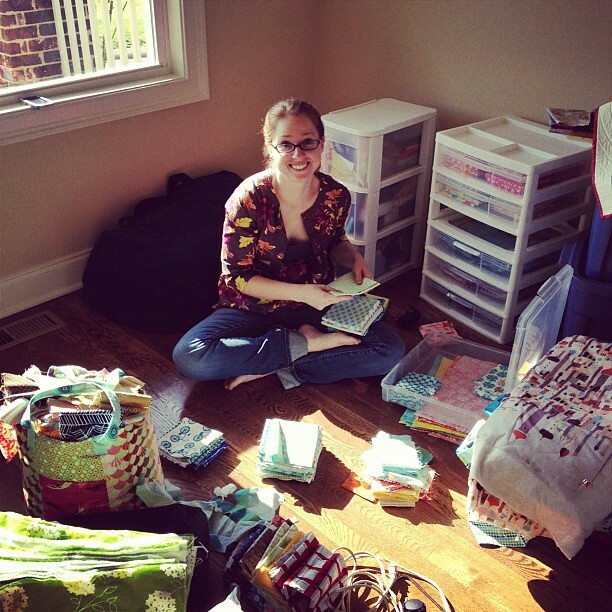 When Ali arrived, she immediately started tackling my disorganized mess of fat quarters! Gotta love friends who will fold your fabric! 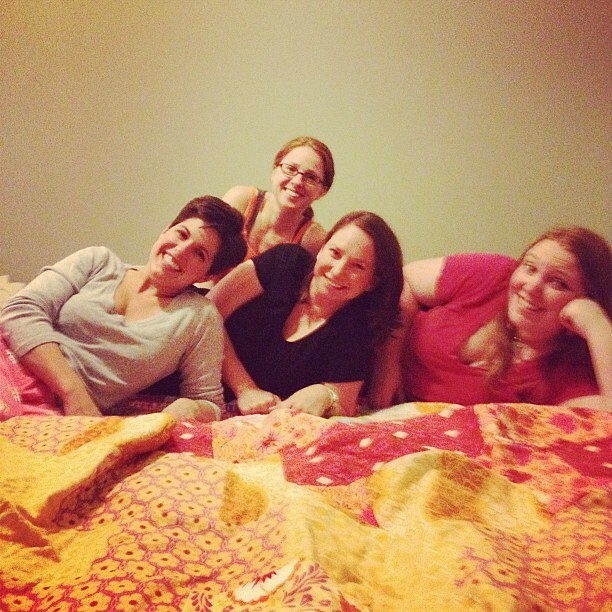 The first night we all hung out, talked on our phones, and ate brownies! The girls (including some that couldn't make it) gave me the most amazing housewarming gifts!!!! I was really floored at the thoughtfulness and generosity. Seriously, I have the best friends! Ali even made this print for me! You can't tell in this pic, but it's mounted on a block of wood! 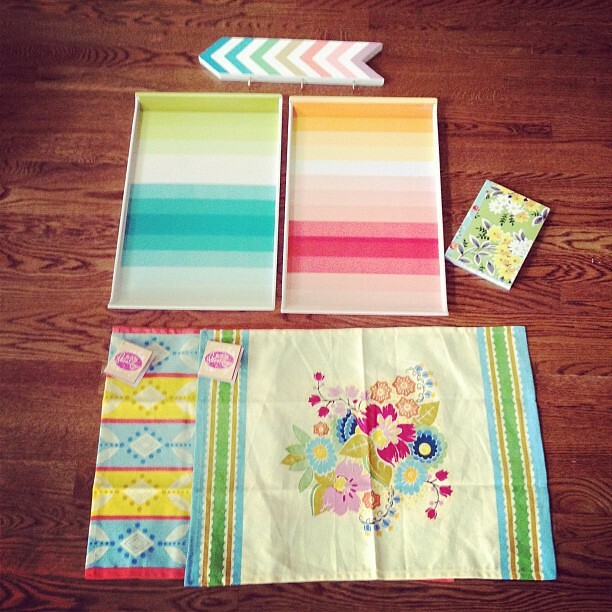 I love Ali's prints and I think I may have order some more for my new sewing room! The next day we went to this fabulous store near my new house! Those are BAGS of fat quarters! 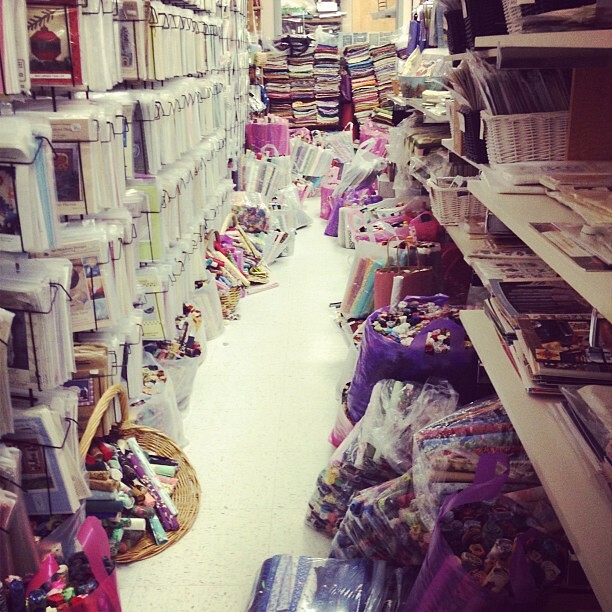 The store is in total disarray, but they have lots of great stuff. Sadly, they don't offer any guild discounts or sales of ANY kind. That's right, they NEVER have a sale! I guess that explains all the unsold FQs, huh? 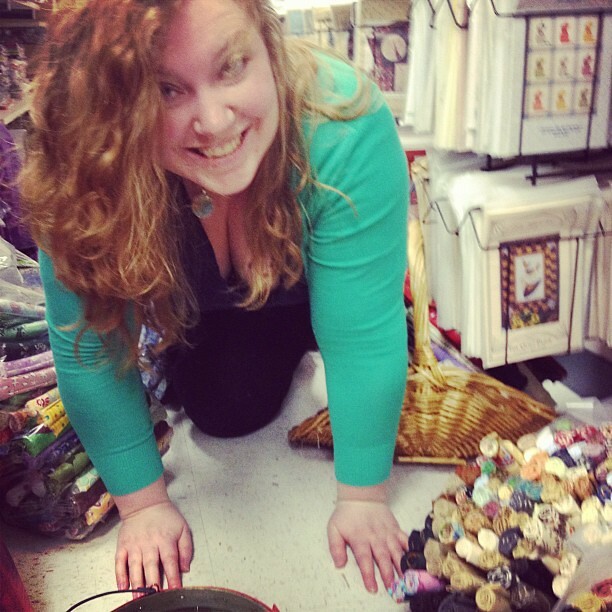 After we realized there were some hard to find Anna Maria Horner prints in that mess, we weren't too proud to crawl around on the floor to find more! Kaelin was the master at finding these gems! 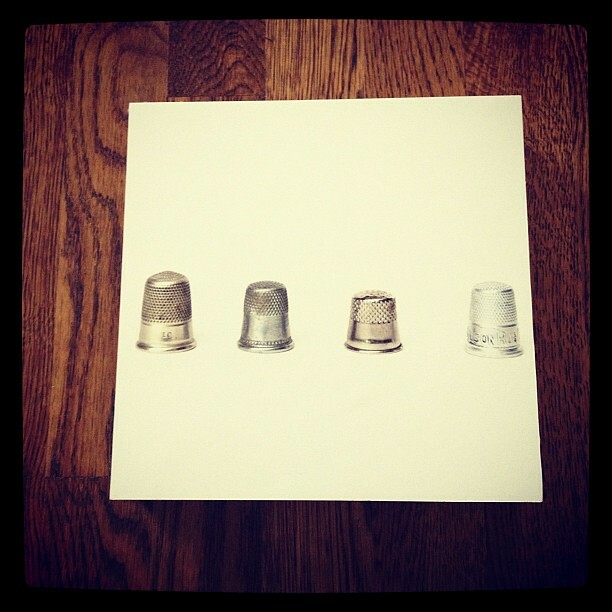 Sadly, the store isn't online nor do they ship. They don't even know what they have! Seriously, it was nuts in there! In case you're curious what's in each of those rolled bundles. 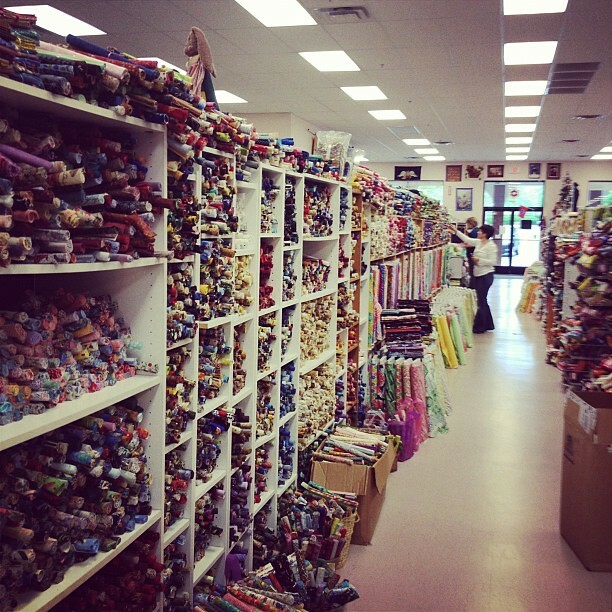 AMH heaven! 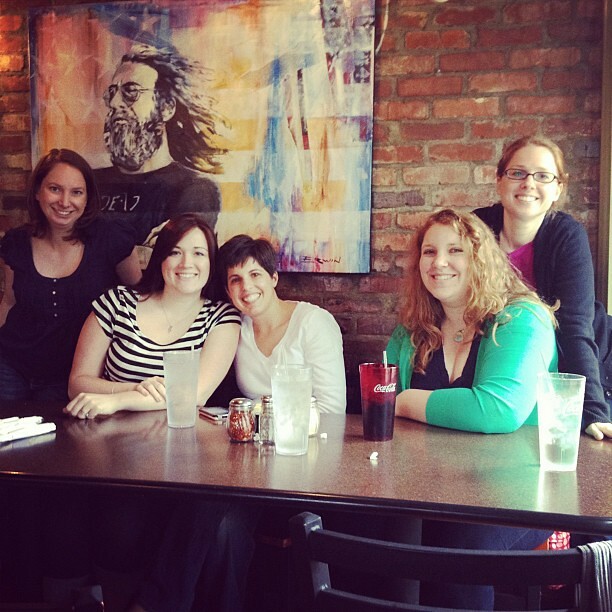 We stuffed our faces with Mellow Mushroom pizza after an exhausting morning of fabric shopping! And we even managed to get in some sewing! 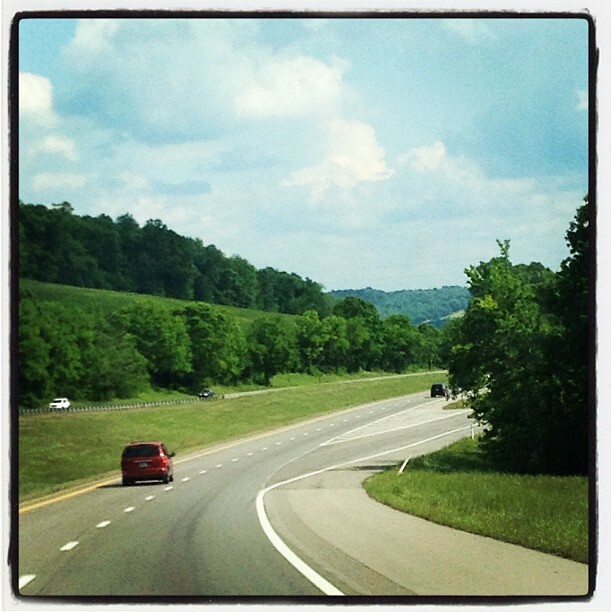 As I drove home through the hills of Tennessee I was already planning our next get together! Oh my gosh! That store is crazy! I'm sure you could spend hours in there going through everything. wow! Katie, she didn't even show the Great Wall of Fat Quarters. She actually did have a sale recently: Before she raised the price on her FQs, she reduced the price to $2 briefly. It did not make a dent in the inventory. Suffice it to say, it's best to have a snack and an energy drink before you go in. Which store is this? I am in Knoxville and travel to Nashville every so often and would love to check this place out! I'm so curious about that store! 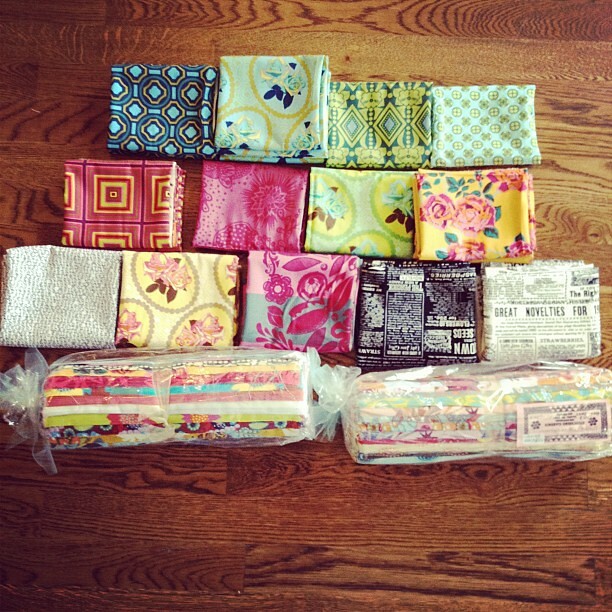 You ladies are as beautiful as that AMH fabric - love the group photo. Those store pics wowed me on IG, they look even crazier today somehow! Seems like the most fun you could have in a weekend!! Oh so fun! And that store- crazy! You got some great stuff! Are you sure you didn't know about the store before you chose the house!? So happy to hear you girls had fun shopping. I really (and I mean REALLY) hate that shop, but one of my best friends loves it. We joke about it at guild because it truly is a love it or hate it kind of shop. She does have lots of hidden treasures in there, if only it were more organized, I might just be able to find them. I'm leaving for AQS Paducah today... so excited! Never mind - I'll come myself! OH MY GOSH! You lucky duck! I can't believe you found some of those AMH prints- like the gold one with roses from her Garden Party line. I envy you! Looks like it was an awesome weekend! I would love to know more about this store! 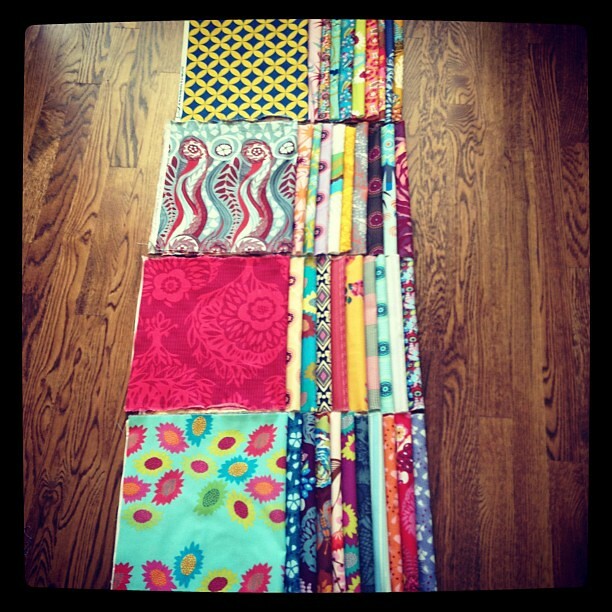 I'm in TN and beginning to quilt but have sewn for many years. Thanks! What a fun weekend! Sewing friends are the best!